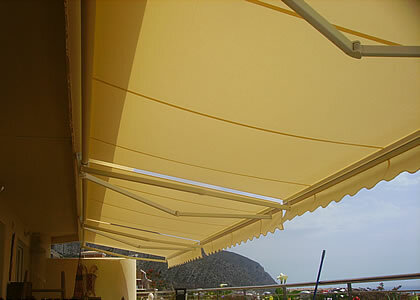 The folding arm awning is designed as a roll up blind for patio and terrace areas. 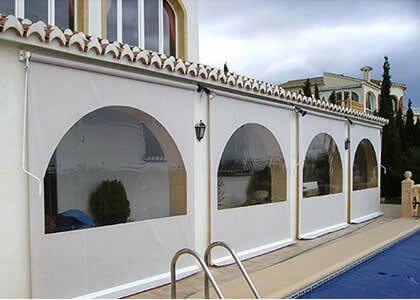 With this type of blind you can create a large shaded area which gives protection against the strong sun and light rain. 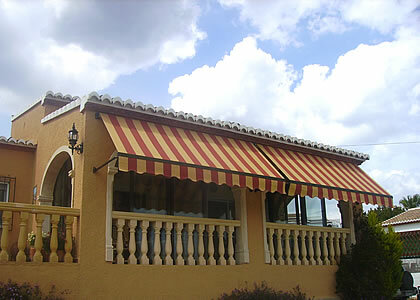 Awnings can be wall or ceiling mounted or installed onto a wooden pergola. The angle of the blind is adjusted during installation. 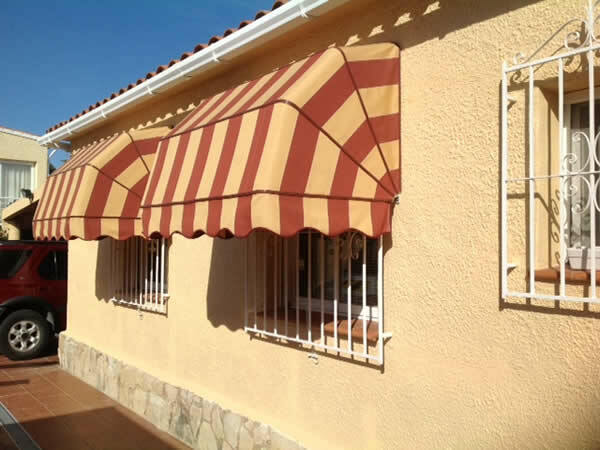 Awnings sunblinds fabrics are 100% acrylic, teflon treated, colourfast and guaranteed for five years, they provide 100% shade and are UV801 certified which gives protection against harmful ultra violet rays. 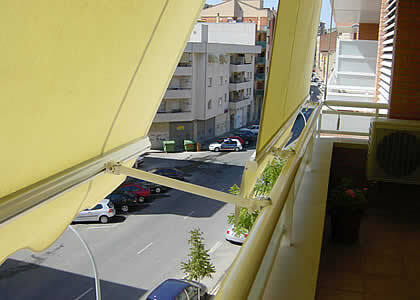 This type of sun blind is designed to stop harmful rays of the sun entering your house, office or shop. This is a more traditional type of blind where the arm supports are totally independent of the main awning supports and when the blind is opened the arm supports pivot in a downwards arc creating the shade required. The arms of the blind are spring tensioned to keep the fabric taut when opened. This type of blind is a good choice for windy locations. 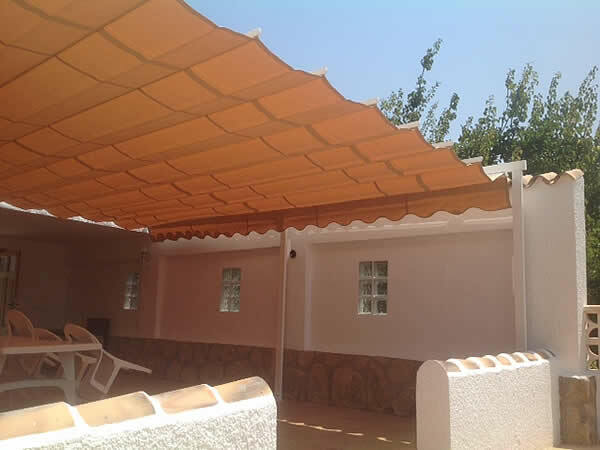 Awnings fabrics are 100% acrylic, teflon treated, colourfast and guaranteed for five years, they provide 100% shade and are UV801 certified which gives protection against harmful ultra violet rays. The balcony awning can be installed onto the balcony ceiling and once lowered is secured to provide protection against the sun, wind and rain. The blind has two operating positions. One using 50cms arms to open the blind and the other to secure the blind in a vertical position. The compact design of the cassette awning gives an elegant, contemporary appearance to the blind. 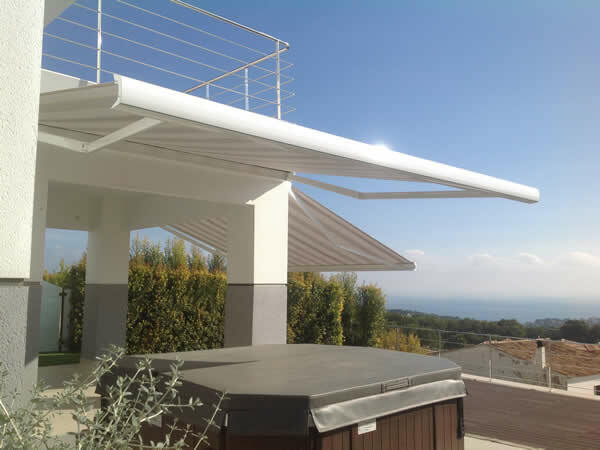 When the awning is retracted the rounded front profile creates a box that protects both the fabric and the mechanics of the blind against the weather thus extending the lifetime of the awning. It. can be fascia or ceiling mounted. Canopy blinds are ideally suited for windows and doors and add a touch of elegance to any home. Attractive by design and simplistic in function, a Canopy blind will provide cover and protection over windows and door ways. Canopy structures can be easily re-upholstered once the fabric has deteriorated. All our pergolas are made to measure and are designed to provide shade over external areas including internal patios.The permanent structure is made of lacquered aluminium 40mm x 80mm profiles with the awning running on guides within the structure. Side blinds can be incorporated to act as a windbreak or for privacy. They can be installed between walls or underneath an existing structure. Once retracted the blind can be protected by an aluminium roof. Designed as a windbreak this vertical blind is available with or without a clear PVC window and can be installed with aluminium side guides. Also available is the “Panoramic” vertical blind with horizontal profiles to strengthen the blind.